What Do You Really Know about St. Brigid, Mary of the Gael? St. Brigid’s feast day is on February 1st, which is the anniversary of her death, and she is a fascinating figure. Many know is she is, along with Patrick, a patron saint of Ireland held in such high esteem that she is frequently referred to as “Mary of the Gael”. She is also the patron saint of “fallen women”, single mothers and their children. 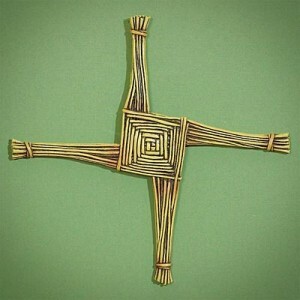 Her distinctive cross woven of reeds is well known and a popular theme in a range of Irish gifts. But there is far more to her life. Brigid was born to a Christian slave mother, and her father was a Druid chieftain. Underscoring her duality, legend has it that she was born just as her mother stood in a doorway with one foot indoors and one foot outdoors. Even as a child, Brigid was upsetting people by giving things away to the needy. Once, she gave away her mother’s entire store of butter but it was miraculously replenished. Her father was frequently upset about her giving away his belongings. Brigid grew up to be clever and not easily intimidated. In one of the most famous legends about her, Brigid goes to ask the king for land to establish an abbey. He refuses. Undeterred, she asked if she can have just the land her cloak will cover. The king laughed and agreed. Brigid asked four of her nuns to each take a corner of her cloak and start walking. They walked, they ran, and the cloak grew and grew covering acres of land. Shocked, the king admitted defeat and granted the land to Brigid. Clever negotiating skills are said to be variation of the Irish gifts of the gab. Perhaps we can thank Brigid for that! When Brigid went with some other women to take the veil and become a nun, Mel, the bishop officiating, saw a pillar of flame rising from her head. When he went to recite the ordination prayer, he spoke the words of the ordination for a bishop, not a nun. Onlookers were shocked, but Mel said it was God’s work, not his, that she was ordained a bishop instead of a nun. She established her famous abbey in County Kildare, on a site sacred to the pre-Christian Celtic goddess Brigid. Under her leadership, the abbey grew into a center of scholarship and art. The school of art and metalwork she founded there produced the legendary, long lost Book of Kildare, which was so beautifully illuminated that those who saw it proclaimed it the work of angels, not mortals. Sadly, although it should be recognized alongside other artistic Irish gifts to future generations, the Book of Kildare was lost around the time of the Reformation. Brigid remains an inspiration for women today. We can remember Brigid today by sharing food and enjoying art and beauty with our nearest and dearest. It’s a wonderful day for women to organize a girls’ night in, religious or not, to appreciate all that they do for each other and their loved ones. Did You Know St. Valentine Is a Dubliner?